When Maxi Mill’s To The Next release came out in July of 2011 it heralded the coming of a new talent, later furthered by his appearance on the Amsterdam All Stars MMXI compilation. 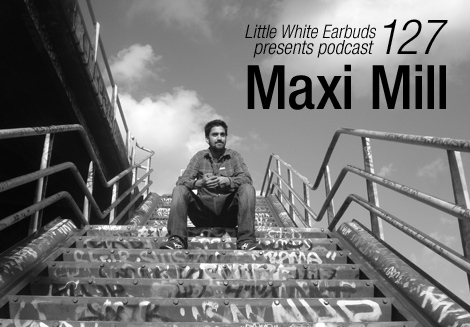 The Amsterdam based producer Maxim Yesodharan had been been working behind the scenes with Tom Trago for some years, garnering co-production credits on some of his tracks. Having originally started out producing hip-hop, Yesodharan turned to making house music four years ago, though doesn’t want to pigeonhole himself by being seen as solely a house producer. LWE chatted with Yesodharan about his ties with Tom Trago, juggling family life with production and what’s he’s got planned for the future. He also put together our 127th exclusive podcast, an engaging mix mostly made up of the work of his Amsterdam compatriots, which showcases the incredible talent coming out of this hotbed of electronic music. You grew up on a diet of hip-hop but are now making house music. Was your love of hip hop more of a teenage thing for you? Is house music the result of your tastes maturing? Maxim Yesodharan: Yeah, but I still love hip-hop you know. The 90s hip hop was also be a big love for me. I mean, sometimes I will still make a hip hop beat now, but yes, it is a little bit in the past for me. So is there a chance that perhaps in the future you might release something of a more hip-hop nature then? So how did you hook up with the Rush Hour guys? Well it was through Tom Trago. He has his sub-label, Voyage Direct, and he released my single. Because you guys had worked together before hadn’t you? Yeah, we used to make beats together from back when I was making hip-hop. We had started by using an MPC back when we were like 18 or something. He has the connection with Rush Hour so it was through him. How long have you been focused on making house music? Oh I don’t know, maybe about four years now. So far you’ve released that 12″ on Voyage Direct, had a track on a Rush Hour compilation and recently completed a remix with Tom. Do you have any pending releases coming up? Yeah, I’m working on a new Voyage Direct EP so that’s almost finished. I spend all of my time making music so we’ll see what else comes out of it, but the Voyage Direct release will be the first thing. So are you doing music full time? Yeah, I used to be a chef but I’ve stopped now and I’m doing music all the time. It doesn’t work really, doing music part time and being a chef part time. It meant both things were only getting half of me, so now it’s all music. So what is your approach then to making sure that you concentrate fully on music? Do you lock yourself down to a certain amount of studio time every day? Yeah basically that’s it. But also I had a kid one and a half years ago, so it’s a matter of still making sure that I take care of my dad duties and then making music around that. The studio is next to the bedroom so it’s now very well soundproofed. I start everything with my MPC. So I make the beats on this and then I record everything into different tracks on the computer. From there I work further and finish off the track like that. Sometimes I strictly make everything on the MPC and then mix it down after, but usually this method of using both is how I’m doing it now. I used to DJ a lot when I was more into hip-hop and played a lot of reggae and that sort of thing, but I’m getting back in to it and playing my house and techno stuff. Do you feel a part of any particular scene? Not really, no. I think because I like different kinds of music I don’t really just follow one thing. For me it is about many different kinds of music but with the same feeling, if you understand what I mean. In that sense then when you’re making stuff as Maxi Mill will we hear different styles coming through on different releases? Yeah, I will be making things that aren’t quite so straight forward, experimenting more with different rhythms. It’s mostly Amsterdam producers and is sample-based house music and a little bit of techno too. The Netherlands has been very strong in electronic music for a long time but particularly over the past few years or so it is such a dominating force. Is there a real sense of community within the scene there, of solidarity? Yeah, I mean, you’ve got the people like Rednose Distrikt, San Proper, and Tom Trago, and it does feel a bit like a community. What clubs do you generally head to, to hear new music? Most of the time it’s Trouw, which is in an old newspaper building. The music there is always good and they always have good line-ups too. I think that’s the best club in Amsterdam now. So what else can we expect from you over the next year? Well there’s the EP for Voyage Direct, but then there’s another project but that is a little bit secret so I can’t say too much on that. But I am looking to do some more remixes too so hopefully that will happen once I get the next release out.